Last updated on March 14th, 2019. 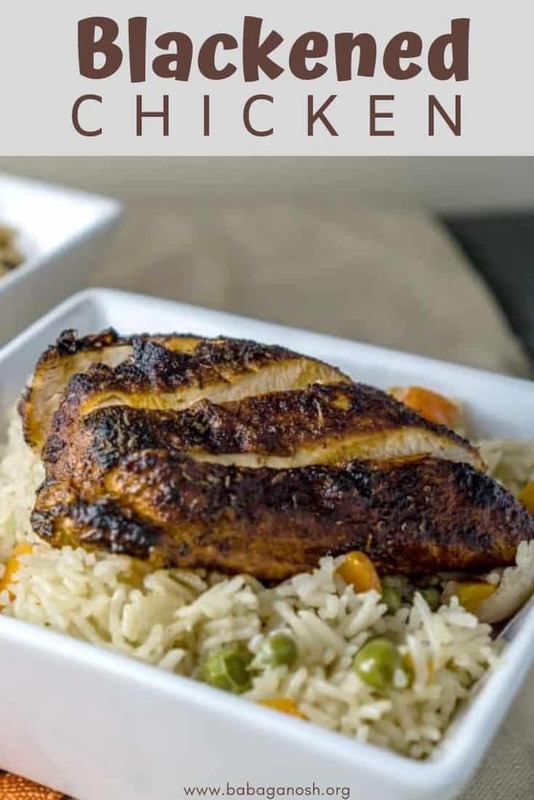 Tender juicy Blackened Chicken over Rice Pilaf made in the rice cooker makes this a very easy recipe. 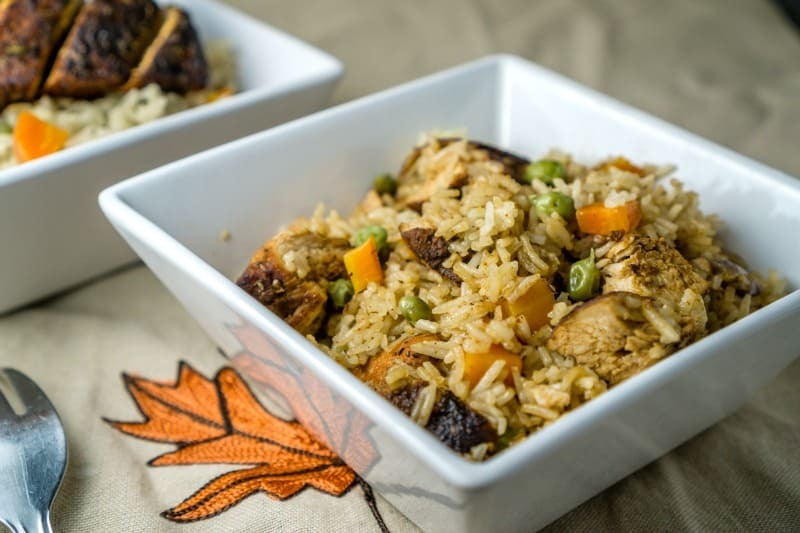 The rice pilaf is made with veggies and fragrant seasonings. This easy, tasty recipe serves 8-12 people and is great for a large dinner party. This recipe is sponsored by Carolina Rice. The recipe and opinions are my own. I can’t believe it’s November already. Daylight savings time ended right on November 1 this year and the early darkness usually marks the beginning of winter for me. From now until April I just want to put on my fuzzy socks and curl up on the couch with a book and a cup of tea. What else is there to do when it gets dark before I even get out of work?? This time of year gets me thinking about good, hearty comfort food and the upcoming holidays. This holiday season is going to be extra special because Aldo’s sister just had a baby, so we have a new niece in the family. We went to visit them a couple of weeks ago, to ooh and aah at the tiny little adorable newborn baby. It was really nice. I swear it’s a conspiracy that babies are on their best behavior when guests are over, making everyone think that having a baby is so easy! When we went to visit them we brought over a huge dish of blackened chicken with rice pilaf that I made. This dish was perfect for the occasion because it is a delicious and festive dish that would feed the whole family and still have leftovers to leave for the new parents. 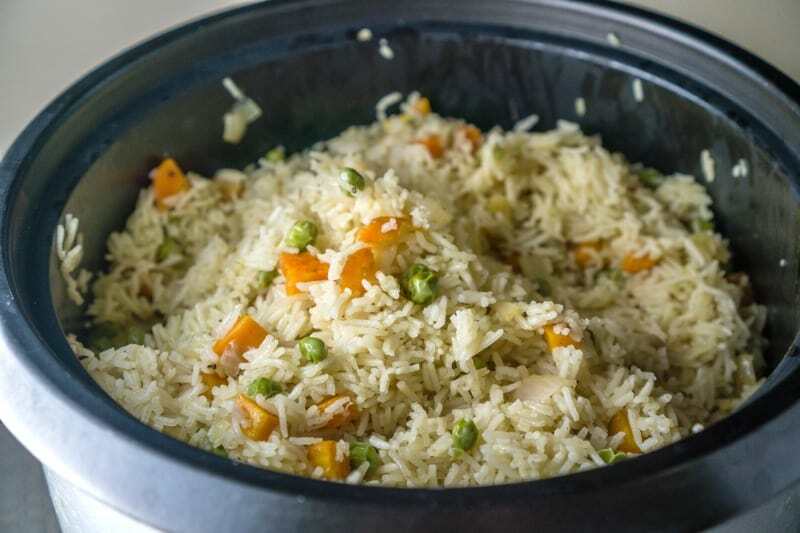 The rice pilaf took less than an hour to make from start to finish, and required minimal fuss because the rice pilaf was cooked in a rice cooker. The blackened chicken cooks very quickly on the stove top while the rice is cooking. The hot heat of the skillet sears the chicken and cooks it fast, leaving it tender and juicy on the inside. And the flavor from all the spices on the chicken is just so delicious. This is definitely a recipe I will keep in mind when cooking for large crowds or if we have family over for the holidays. It’s just so easy and GOOD. 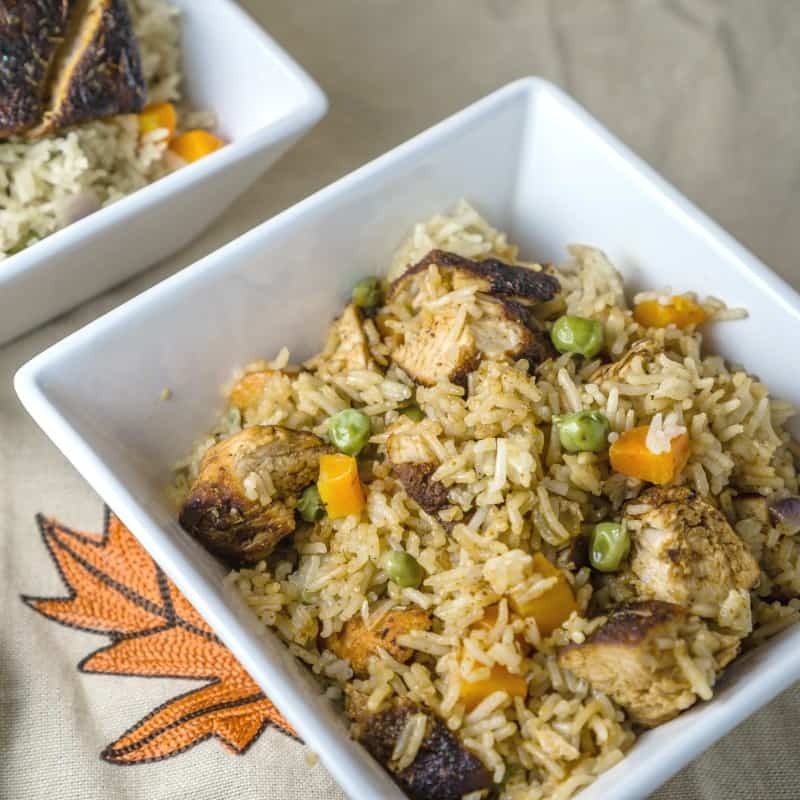 We used Basmati rice in this recipe, which was perfect because it is very fragrant and adds its own delicious flavor, and it cooks up into perfect fluffy rice. I cooked the rice in chicken broth instead of just water to give it even more flavor, and added some oregano to it because Aldo’s grandma traditionally adds oregano to her rice dishes. I also added a dash of cinnamon to the cooking liquid, just to give some more depth to the flavor. Don’t worry, the cinnamon doesn’t make it taste like a cinnamon bun. 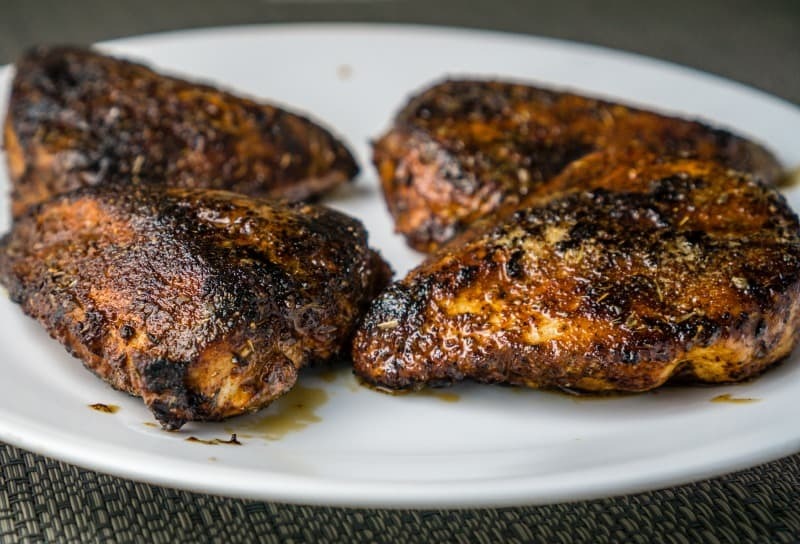 To make blackened chicken, I mix all the spices together in a small bowl, and then generously coat the chicken breast with the seasoning on all sides, using my fingers to press the chicken. You can use this seasoning on other proteins, such as salmon (check out my recipe for Blackened Salmon with Black Bean Mango Relish), shrimp, or chicken thighs. The blackened chicken turned out amazing… mmm mm mmm. That was good enough to eat on its own, but I resisted, and roughly chopped/shredded it into bite sized pieces and mixed it in with the rice. Not to toot my own horn, but this whole recipe came out DELICIOUS. In a large skillet, heat 2 tablespoons of olive oil, and saute the diced onion, garlic, and carrots for about 5 minutes, or until the onion and carrots soften. In a 10-cup or larger rice cooker, combine the rice, chicken broth, salt, olive oil, cinnamon, and oregano. Add the sauteed carrot/onion/garlic mixture and the fresh or frozen peas (no need to thaw). Follow your rice cooker's directions for the amount of liquid needed to cook 4 cups of rice. Our requires 1 extra cup of liquid (so 5 cups of liquid for 4 cups of rice), which is why I used 1 quart chicken broth + 1 cup water. Cook the rice in the rice cooker until it is soft and fluffy. Fluff the rice with a fork and keep warm. Combine all the spices and herbs for the blackened chicken in a small bowl (from paprika through oregano). Mix well. Place the spice mixture in a plate and press the chicken breasts into the spice mixture on both sides to coat the chicken. In the same large skillet you used for the onions and carrots, heat 4 tablespoons of butter. Carefully place the spice-coated chicken breasts into the butter, and cook over medium heat for about 5 minutes on each side, or until the chicken is fully cooked. If the chicken is blackened but not fully cooked, just lower the heat and cover with a lid, cooking until the internal temperature reaches 165F. 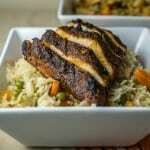 Serve the blackened chicken over the rice pilaf, or chop the cooked blackened chicken and mix with the rice. Deeee-licious recipe Kate! 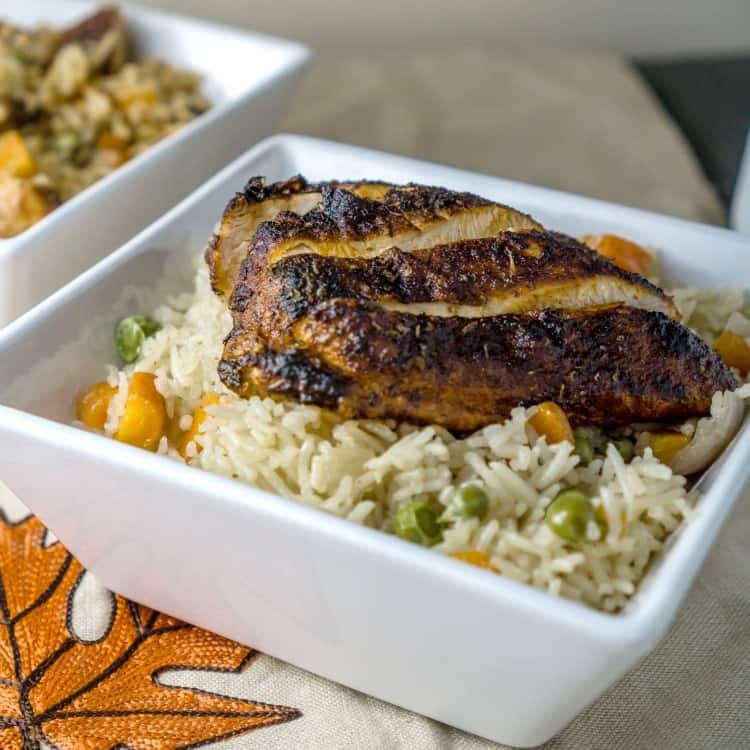 We loved the cajun style blackened chicken and indeed this must be soooo good with the pilaf!